After the LORD struck down 185,000 of the Assyrians who were camped outside Jerusalem, Sennacherib returned home and lived at Nineveh. In the final verse of this chapter we are told that his sons killed him and fled to the land of Ararat. The Biblical land of Ararat (Urartu) is located in modern eastern Turkey. We might think of the land of Urartu being centered in Lake Van. From Nineveh to Van is an air distance of about 150 miles. The map below is from the Wikipedia entry on the Urartu-Assyria War. Click the map to enlarge. Lake Van is 5737 feet above sea level. 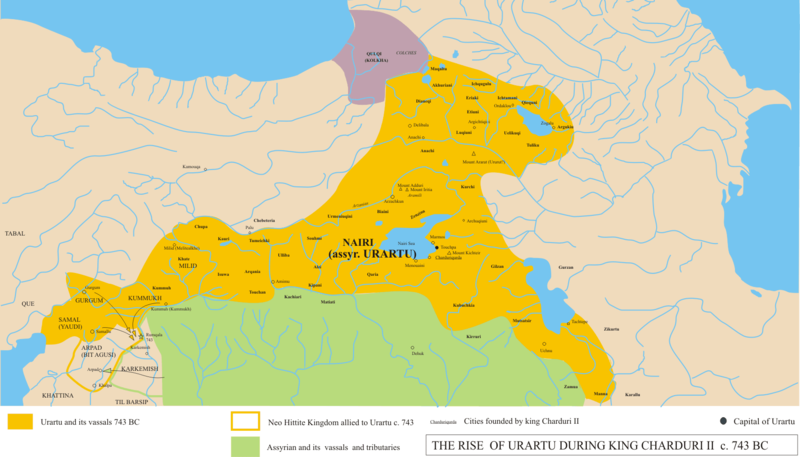 Map of the Urartu-Assyrian war in 743 B.C. Wikimedia Commons. The entirety of the land of Urartu is mountainous. 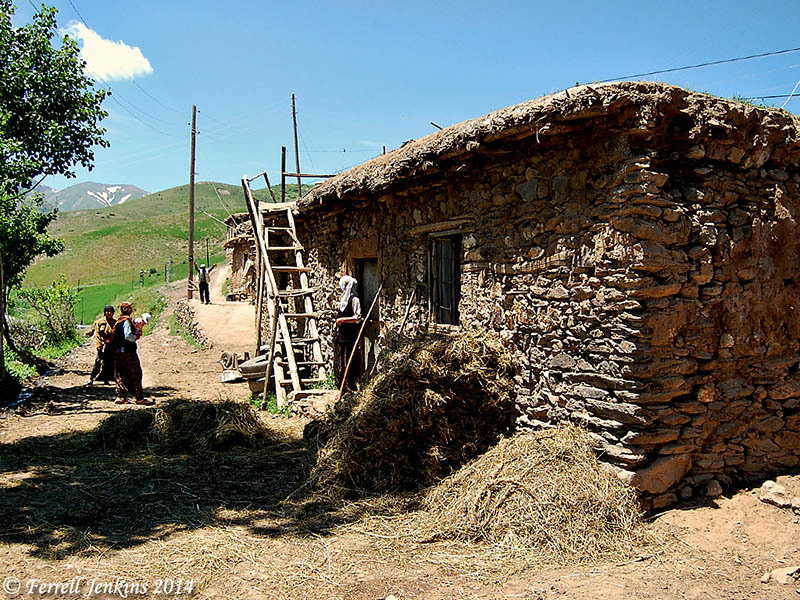 Our photo below shows the region between Van and Batman in Turkey. Note the snow-covered slopes in the distance. A house in Turkey between Van and Batman. In ancient times the area was known as Urartu (Biblical Ararat). Photo by Ferrell Jenkins. Use our search box to look for more entries dealing with Urartu. Remember that the ark built by Noah came to rest on the “mountains of Ararat” (Genesis 8:4). The photo below was taken in the Anatolian Civilizations Museum in Ankara, Turkey. It shows (the metal legs of) some Urartian furniture. In the left bottom corner you should see some of the ivory pieces that decorated walls and furniture. 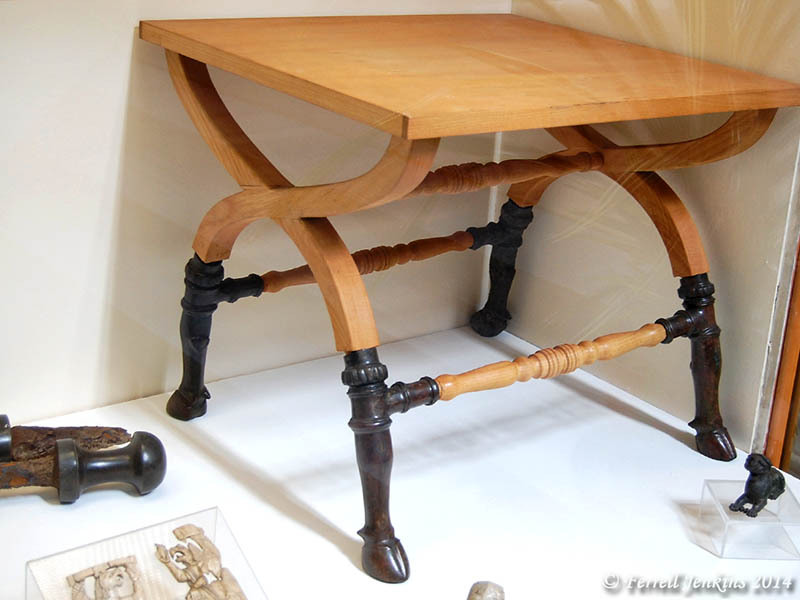 Urartian furniture displayed in the Anatolian Civilization Museum. Photo: F. Jenkins. 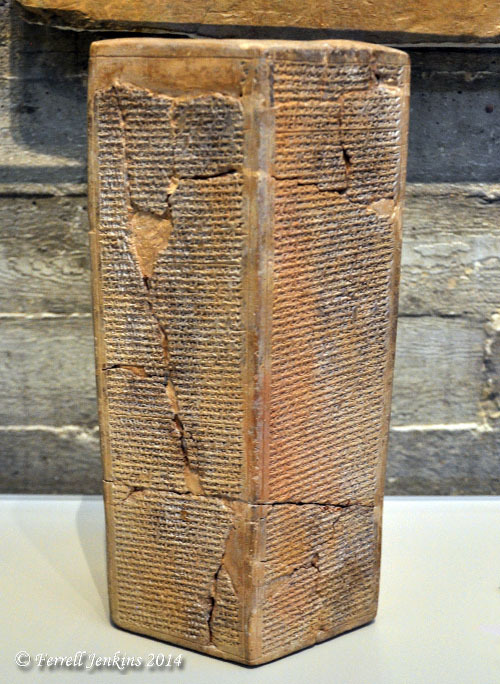 There are three known clay prisms in which Sennacherib mentions Hezekiah, king of Judah. Sennacherib admits in the prism-account that Hezekiah did not submit to his yoke, but was “shut up in Jerusalem” like a caged bird. The Jerusalem Prism, now displayed in the Israel Museum, is perhaps the least well-known of the three documents. Our photo shows that document displayed under the replica of the relief of the siege of Lachish. The Jerusalem Prism mentioning Hezekiah. Photo by Ferrell Jenkins. The account in Isaiah 36 is rooted in history.